Last Dec. 13, 2011, FILCOLS Member and UP ICW Associate Dr. Mario I. Miclat was given a recognition before the officers, associates, fellows, staff members and friends of Institute of Creative Writing at the ICW office, 2F, Faculty Center, UP Diliman, Quezon City. The ICW Christmas Party was halted momentarily as the emcee signaled the start of the surprise tribute for Dr. Miclat. Three literary giants delivered their testimonials. First was National Artist for Literature and FILCOLS Chairman Emeritus Virgilio S. Almario. Then came National Artist for Literature and FILCOLS Member Bienvenido Lumbera. Last but definitely not the least, the winner of National Book Awards for Non-fiction, Prof. Romulo Baquiran, Jr. 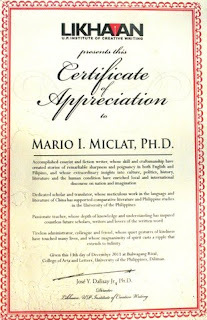 The Certificate of Appreciation was awarded by Dr. Jose Dalisay, the Director of ICW and also a FILCOLS member. FILCOLS Executive Officer for Membership and Documentation Beverly Siy served as the emcee. Posted here is the copy of the certificate. Congratulations and Best Wishes, Dr. Mario Miclat, from your FILCOLS Family.